Instrumentation: 1 piccolo, 1 flute, 1 oboe, 2 bassoons, 2 alto saxophones in Eb, 1 trumpet in Bb, 2 horns, 1 trombone, 1 tuba, timpani, solo flute. Commissioned by the Texas Music Teachers Association in 1992. Dedicated to Jeannie Larson in honor of Joe Tallal. 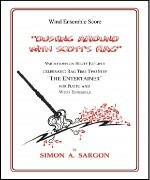 Premiered by the Meadows Wind Ensemble, Dr. Jack Delaney, Director, at Southern Methodist University, Dallas, Texas, in 2004. Other versions available are flute/piano (Southern Music #SU244, CMWB 112) and flute/orchestra (Southern Music #R142, SI 101). Availability: Rental Only. Contact composer.